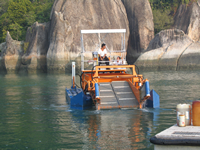 In order to meet customer’s requirements, Marina Cleaners are available in fresh water or salt water versions and feature an articulating vertical wing capture system that delivers debris to the front pick-up conveyor. Large and small objects are easily retrievable and roll back is prevented with cross cleats. The MC’s Marina Cleaners are built with a low profile configuration for navigation under lower overhead obstructions. The operator’s cab is mounted on the upper deck allowing for placement of the diesel power unit, hydraulic and fuel tanks as well as the operators control area. This design also permits clear passage of large objects retrieved by the skimmer head, into the open storage conveyor. The upper portion of the operator’s cab is removable for shipping and road transport. • A complete Hydraulic System for all skimming, load handling, and propulsion functions, with variable speed control at the operator’s finger tips. • A Air Cooled Diesel Hydraulic Power Unit, placed into a noise proofed, lockable engine room. • Lockable Hydraulic Oil Tank, Filtration, Hydraulic Oil Cooler, Hydraulic Directional Valves. • Stainless Steel Hydraulic Cylinder Rods. • Operator’s platform with a seat and console with engine controls monitoring system including warning lights, tachometer and hour meter, and hydraulic controls with pressure gauge. • Conveyor Belt System made of heavy duty Stainless Steel supported by UHMD plastic tracks and interchangeable floors. • Front Conveyor with adjustable depth setting and cleats mounted to belts. • Twin Pontoon Steel Hull “hydro-dynamically” shaped, including multiple compartments, inner ribbing, tie and lift cleats, drains and vents, anti-skid deck, bottom skids, rub rails, gunnels. 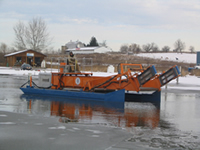 • Two independent, bi-directional Hydraulic Propulsion Units with variable speed controls, bronze propellers, stainless steel shafts, drop arms, and hydraulic connections, as well as tunnel guards, and power tilt.